About ten years ago we took a family trip to the West Coast. I was the planner of places to stay and things to see. One of my choices was a gondola ride through the forest canopy of the redwoods in northern California. About half way up the ride I felt my stomach lurch as I looked down and remembered that I am afraid of heights. My next thought was "Why didn't I think of this before I got up here?" I had a similar thought a short way into a weekend glassblowing workshop at NOCA Glass School in North Cambridge, MA. I had received an email from Cambridge Center for Adult Education about weekend classes and saw one for making drinking vessels. It sounded like something new and different, and wouldn't it be nice to have a few drinking vessels that I had made myself? I didn't process the idea of glassblowing at all. When I arrived and saw the glowing furnaces I began to wonder why I hadn't thought this through a little further. When I sat at the bench as a practice run and raised my right hand and said, "I swear I don't want to burn myself today," I thought I really should have thought this through more fully. On the first day we made a rounded glass glob (which they generously called a sculpture) and a paperweight. The day ended with a demonstration of what we would be doing the next day. On Sunday, we blew a glass sphere and made two drinking vessels. In this short time frame, the workshop was as much product as process oriented. Jesse and Amanda did their best to have us understand all the steps and what skills were required but gave us considerable assistance at every stage so that we would have objects to take home. Well come back for, as the glass needs to cool slowly and there was grinding and polishing (which was done for us) to finish our creations. It was a huge challenge. There were new tools, new techniques, lots of steps in any one sequence, and always the fact that the glass is 2,000 degrees in the furnace and everything it touches is also incredibly hot. It's pretty obvious that one shouldn't touch the molten glass but oh so tempting to grab onto the rod or one of the tools in a hot place. I came home each day mentally and physically exhausted. That weekend made me think about myself as a learner. I know there were many things that led me to calligraphy, most especially my love of words, but I also think how much easier it was to learn than glassblowing. There was nothing dangerous about making a misshapen "a "or spilling a little ink. I also think I am most comfortable when I can learn alone. Perhaps the things I have chosen to do—calligraphy and bookmaking of a simpler rather than more complex sort—have been attractive for that quality as well as others. I like to think I am a sympathetic and encouraging teacher but it's always instructive to put oneself in a new learning situation, especially one that is as foreign as glassblowing. I'll treasure my glass objects as they sparkle in the sun. They will also have a place in my mind as I teach as a reminder of what it is to be a learner in a new world. ah glass I love it, spent 20 years of my life engraving, carving and cutting it but blowing is whole other world! it's a dance, a performance & as you say very dangerous, the alchemy of the process is so exhilarating, it makes my heart race with the adrenaline but is not for me. 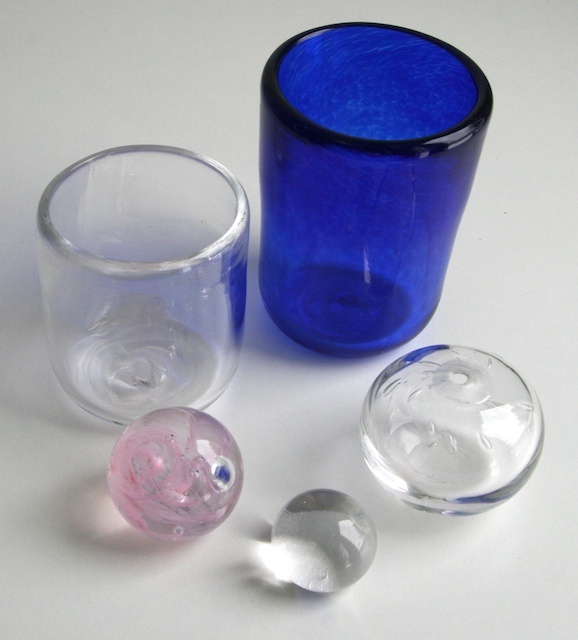 I love working quietly in the privacy of my own space & when I need a piece of glass blown i ask my friends who have a studio and pay them in kind! Thanks Nina. And Mo, that's it absolutely-working quietly in the privacy of my own space. It's great to appreciate all the possibilities and also to find one's own particular place. I love what you say about the privacy of your own space. That is at the heart of my art making. I love the fact that you took the leap in spite of your doubts. The results are beautiful. I feel much the same confronting a new class, often thinking that it would be more fun back in my studio. And it is--so much sweeter when I return with new ideas and directions.